Silver Price Set To Start 70s Style Rally? The structure of the current silver bull market has a lot in common with the 70s one. However, there are also some differences, which actually favour a stronger silver performance during this bull market. One important difference that favours silver this time around, which I dealt with in a previous article, is the fact that the current silver bull market started at a much different and more favourable time for silver as compared to the 70s bull market. This bull market actually started after or closer to the Gold/Silver ratio reaching an all-time high level (in terms of time and the ratio value) as supposed to before or closer to the Gold/Silver ratio reaching a significant low (in terms of time and the ratio value), like in the 70s. Which means that silver was very undervalued as compared to gold (and still is), at the start of the current bull market, so it has more room to go higher versus gold and fiat currency. The Gold/Silver ratio was around 30 at the start of the 70s bull market, which is much lower than the 66 of November 2001. The top chart is silver from 1966 to the end of 1979, and the bottom is silver from 1999 to August 2015. I have highlighted key events on both charts to show how the structure of the two bull markets could be similar. The current structure is bigger in terms of time. The Dow/Gold ratio peaked in January of 1966, before the start of the precious bull market. In a similar manner the Dow/Gold ratio peaked in August 1999, before the start of the current bull market. Some time before the first important peak of the silver price in February 1974, the Dow again made a significant peak (in January 1973). This is very similar to the October 2007 peak of the Dow, which came before the April 2011 peak in silver. Again, after the Dow peak of February 1974, there was another significant Dow peak in December 1976, some time before the peak of the silver bull market in January 1980. In May of this year, the Dow made a peak, which could be its ultimate peak for its long running bull market. If this is actually the peak, then it is similar to the Dow peak of December 1976, which came some time before the peak of the silver bull market. So, if this fractal analysis is accurate, then we will see significantly higher silver prices over the next several years. Another important difference of this bull market compared to the 70s bull market, is the fact that the current Dow peak before the ultimate silver top is actually much higher than all previous Dow peaks during the silver bull market. During the 70s, that similar Dow peak (December 1976) was actually lower than the January 1973 peak. I think this will prove to be significant, since the crashing Dow will act as fuel for the rise in silver prices. For more of this kind of analysis on silver and gold, you are welcome to subscribe to my premium service. 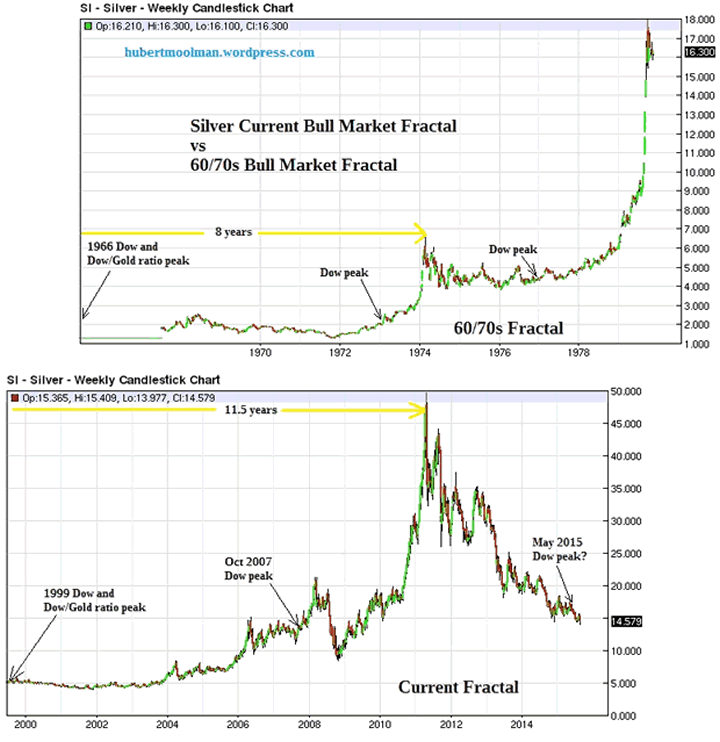 I have also recently completed a Long-term Silver Fractal Analysis Report.